A CNN-IBN and the week Pre-poll survey for Himachal Pradesh conducted by Centre for the Study of Developing Societies shows a close race between the Bharatiya Janata Party and the Congress in 2012 state assembly election. As per the survey, findings reveal that the BJP is estimated to get 41 per cent of the total vote share. Himachal has shown a trend of changing governments at every election since 1990 but this time the trend is likely to change. 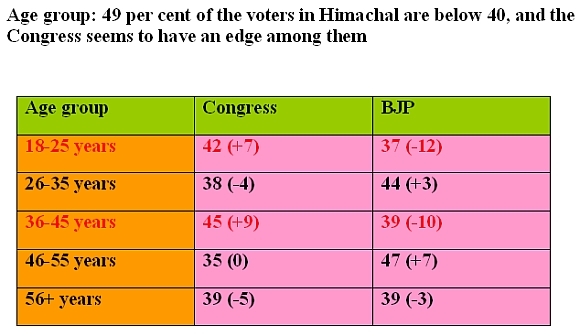 In an east-west regional divide, the survey suggests, the Congress is expected to score well in east Himachal whereas the BJP is well ahead in the western region. 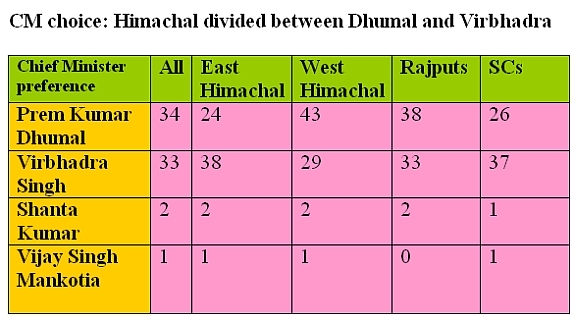 The Congress will be doing well in the Shimla region and the BJP is well ahead of Dhumal's hometown Hamirpur region. The survey shows that the pro incumbency sentiment is stronger than anti-incumbency sentiment, with 40 per cent of respondents agreeing for a second chance for the incumbent BJP government. Only 34 per cent responded in the negative to the question of another chance for the BJP government. For the chief minister's post there is a close fight between Prem Kumar Dhumal and Virbhadra Singh with 34 per cent of respondents preferring Dhumal over that of 33 per cent for Virbhadra Singh. Shanta Kumar is far behind in the chief ministerial race with only 2 per cent of respondents voting for him. The Survey also suggests that Dhumal's popularity has gone up since 2007 with the decline of Shanta Kumar. 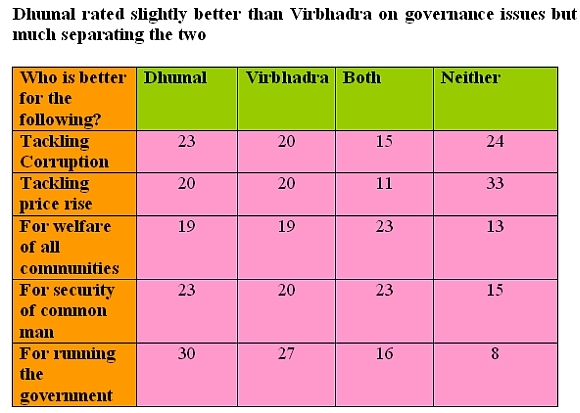 The pre-poll survey shows Dhumal is slightly rated better than Singh on governance issues. Dhumal's incumbent government is rated better than previous Singh government though there is a very close race. The survey shows corruption is not the poll issue this time though both the BJP and the Congress are seen as corrupt in the state. Price rise is going to be the decisive poll issue followed by the farmer's issues. While 47 per cent of respondents feel both BJP and Congress both in the state are corrupt, the Congress is considered more corrupt. The survey shows that people say corruption charges against Virbhadra are a political conspiracy, even as BJP are supporters divided on the issue. 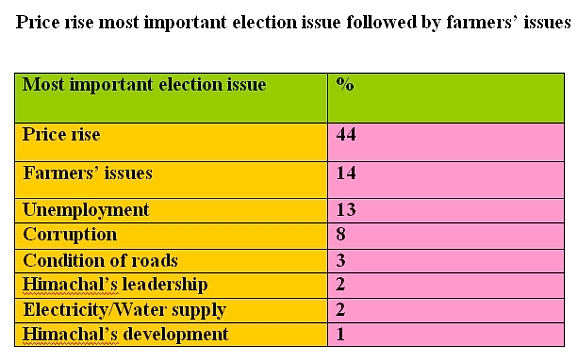 According to the survey, 44 percent of respondents said it was the most important election issue. Thirty-eight per cent of the respondents said the Congress-led Central government was responsible for price rise, while only 12 per cent blamed the state for it. Thirty-one per cent said both were responsible for the situation. According to the survey, 49 per cent of the voters in Himachal are below 40, and the Congress seems to have an edge among them. In a close election they could make all the difference.